Armchair commentary always takes a hit on a weekend because, quite simply, you spend a lot less time in the armchair. So without further ado, here is a wrap of the final weekend in Istanbul which offered up a new tournament champion, some quality tennis, and plenty of juicy plot-lines entering 2012. Player of the year: Petra Kvitova‘s absorbing three-set win over Victoria Azarenka in the final went a long way to cementing her — unofficially at least — as the player of the year in 2011. With the four Slams being split between four players and a pervading sense of parity (or instability) throughout the tour, Kvitova’s resounding win at the prestigious event elevated her above all other candidates. Although Caro matched her haul of six titles, the Czech’s Wimbledon and WTA Championship titles were much more significant than anything Wozniacki achieved. Add to this her sparkling 19-0 indoor record, titles on all four surfaces and her rise from no. 34 to no. 2 and you see a player with a compelling case for POTY honors. A new era? The weekend’s results caused a significant shift in the upper echelons of the WTA rankings, with Kvitova and Azarenka leap-frogging Maria Sharapova into second and third place respectively. For all the talk of veterans flourishing on tour — which remains true at Grand Slam level at least — the top trio are the youngest players in the Top 10. With Wozniacki and Kvitova just 21 and Azarenka just a year older, they have many more years ahead of them, and with the players possessing contrasting styles, the stage could be set for a compelling three-pronged rivalry into the future. Trivalry? We sort of dig this trio. Inflated ranking: How on earth was Vera Zvonareva ranked no. 2 as recently as the US Open? The Russian, who now sits at no. 7, finished the round-robin stage with a mediocre 1-2 record. Somehow she qualifyied for the semifinals thanks to a count-back technicality, but it was there that she was comprehensively outplayed by Vika on Saturday, a player she had won six of her last nine matches against. With the emotional, mentally-fragile Vera of old resurfacing in Istanbul, the chances of her repeating her major final appearances of 2010 and re-ascending the rankings ladder in 2012 seem increasingly slim. Tight battles: While it may not have been the best quality tennis ever staged, the championships produced some resounding battles that thrilled the fans in Istanbul. In the round robin stage, Zvonareva and Wozniacki fought out a tough three-set match on the second night of the event, and the next day, Zvonareva again found herself in a three-set fight, blowing a 5-3 final set lead and match points to hand Agniezska Radwanksa a 1-6, 6-2, 7-5 win that featured several rallies worthy of the highlight reel. The final weekend was no different: Kvitova came through roller-coaster affairs against Sam Stosur in the semis and Vika in the final, defeating both in dramatic three-set contests. Success story: More than 13,000 spectators reportedly packed into the Sinan Erdem Dome for the final, continuing a run of impressive crowds that attended each session. The support for the championships in Turkey was one of the bigger stories of the week and was pleasantly surprising given the event’s prior flops in Los Angeles, Madrid and Doha. With a state-of the-art venue, knowledgeable and enthusiastic crowds and an atmosphere the players relished, the unofficial “fifth major” has had some of its former glory restored and appears to be in good hands for the next two years in Istanbul. Matt Trollope began covering tennis in 2008, a natural extension of his childhood obsession for the game that included hitting for countless hours against his bedroom wall and self-producing and editing a fictitious tennis magazine. Based in Melbourne, he has covered four Australian Opens and one Wimbledon championship, and his tennis writing has featured in Australian Tennis Magazine, the Australian Open Official Program, and Alpha Magazine. Stat of the day: A lot was made of the H2H records involving Sam Stosur entering the tournament — 0-9 against Maria Sharapova, 0-4 against Victoria Azarenka, yet 5-0 against against Li Na. Playing the Chinese prlayer in Istanbul, Stosur improved that to 6-0, with a demoralizing 6-1 6-0 win handing Li her heaviest professional loss in five-and-a-half years. Stosur has only ever dropped one set against Li in her career, and thanks to the victory, now takes her place in the semifinals in Istanbul. Typical WTA moment: Women’s tennis is never short of drama, with cat-fights, tears, and the grunting issue among its many facets. Controversial figures have also been a mainstay — how many times have we seen crowds in the past turn on Venus and Serena, Sharapova, Henin and Hingis? Today it was Vika’s turn. The Belorussian has never made a habit of trying to please people — her shrieking being a prime example — and today was no different. Already having qualified for the semifinals, she appeared to tank in the final set of her last round-robin match against alternate Marion Bartoli, gave the Frenchwoman a poor handshake, and was booed off the court at the Sinan Erdem Arena. Startling admission: All Agnieszka Radwanska had to do was win a set in her match against Petra Kvitova to qualify for the semifinals, and leading 5-1 in the opening set, it appeared she was on track. But Kvitova improved her level, took the set in a tiebreak, and ran out a 7-6(4) 6-3 winner. “Even when I was 5-1 up in the first set, to be honest, I didn’t feel I was close to win[ning] the set,” Aga said following the match. That’s (a lack of) confidence right there. The result allowed Vera Zvonareva to progress to the semis, and despite Vera owning a mediocre 1-2 win-loss record this week, her overall game-winning percentage proved better than the Pole’s. 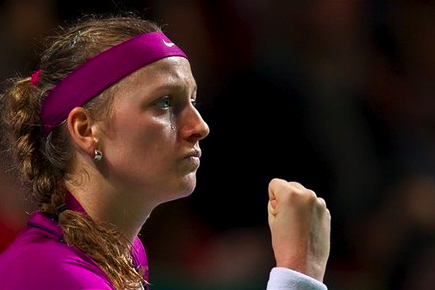 Thought for today/tomorrow: Can anybody stop the Kvitova juggernaut? The Czech is the only player to go undefeated in Istanbul — she hasn’t dropped a set — and enters her semifinal against Stosur with a 2-0 winning record over the Australian. A final against Azarenka seems to be looming. Flashback: We know some of you have been nostalgic for classic women’s tennis this week, so why not a little taste of it from the Chase Championships in 1996. Steffi Graf beat Martina Hingis in one of the few five-set encounters in women’s tennis history, 6-3 4-6 6-0 4-6 6-0. Cheers, ladies! Stat of the day: Vera Zvonareva defeated Caroline Wozniacki in three gruelling sets in the last match of day two action in Istanbul. The primary reason? The Russian’s 49 winners to the Dane’s 13. Note to Caro: relying solely on superb defensive skills just won’t cut it at the highest level. Yet while that may be, Wozniacki has secured the year-end No.1 ranking for the second straight year thanks to Maria Sharapova‘s withdrawal from the event due to a persistent ankle injury. Typical WTA moment: Masha’s withdrawal continues the unfortunate theme of WTA events lacking in star power. The past four winners of the Championships since 2006 — Kim Clijsters, Serena Williams, Venus Williams and Justine Henin — all failed to start, and with 2004 winner Sharapova now gone as well, the event is missing the five most successful players of the past decade. Could you imagine the equivalent scenario occurring at the ATP World Tour Finals? If Federer retired before it began, Nadal, Djokovic and Murray didn’t enter because of injury, and then Del Potro withdrew during the week, the tournament would be decimated. Intriguing interviews: Caro added some spice to the event by telling reporters that she thinks some players grunt on purpose. “They don’t do it in practice and then they come into the match and they grunt. I think they [officials] could definitely cut it,” she said. Does this mean she thinks the same of her friend Victoria Azarenka, also in the draw and who’s one of the loudest shriekers out there? That potential match-up may have gotten a whole lot more interesting | Speaking of complaints: Agniezska Radwanska aired her grievances about the court at the Sinan Erdem Dome. “It’s pretty slow. It’s weird bounces, and surface very sticky so it’s hard to run, as well,” she said. But it’s not all doom and gloom in Turkey — Caro and Masha shared their enthusiasm about the potential combining of the ATP and WTA year-end events. “It would definitely be nice to see. I think that would be a lot more fun for the fans to see the men and women together,” Sharapova said. The ATP will have to streamline their calendar first — its World Tour Finals are still almost a month away. Photo of day: We’ve always loved Vika’s intense post-match winning celebrations. Today’s win over Sam Stosur was no different. Thought for today/tomorrow: Who will come up trumps in the match between Azarenka and Li Na? Given that both women own unblemished records in the tournament so far with one straight-set win apiece, the winner will break the deadlock in the White Group, vault to the top of the group standings and put themselves in prime position for a semifinal berth. Words of strength. The WTA lined up its stars in Japan to voice their support for a country that has struggled since the massive earthquake this spring caused severe tsunami damage and the radiation and flooding disasters. Classy move, gals. Not just Nole. On Sunday night in Oklahoma City, Andy Roddick showed attendees at the exhibition featuring himself and Mardy Fish that it wasn’t Novak Djokovic who can pull out impressions of fellow tennis players. Skip ahead to the 1:51 mark if you want to see Roddick’s Serena impression, including (just for a flash!) her 2009 US Open tirade. It was one that had us cracking up out loud, and brought to mind the famous “bump,” which — upon watching it again — may have delivered more force to Flushing Meadows than Irene herself. Hard to believe this was 14 years ago in 1997, when a 17-year-old Venus Williams took down Irina Spirlea, the Romanian, 7-6 (5) 4-6 7-6 (7) in the semifinals. It happens tomorrow: The Xperia Hot Shots video series will unveil the hottest shot of them all. The six ladies — Alize Cornet, Bethanie Mattek-Sands, Sorana Cirstea, Dominika Cibulkova, Sabine Lisicki and Heather Watson — battle out for a $100,000 payday. Fans could submit their votes up until Aug. 22. But this is all about popularity, right? We’re going with Lisicki on this one… and not because we want her to win, only because we think she is going to win. Above: Sabine takes a few fans’ questions and then one suggestion — serving blind-folded in her final vid. Open-bound: This past weekend was a big one for 16-year-old Madison Keys. The up-and-coming US teen went through three rounds of tennis to earn a win at the Wildcard Playoffs event in DC, scoring herself a spot in the main draw of the Open. Keys took out last year’s media darling of the US Open — Beatrice Capra — in the final, 3-6 6-4 6-0. Keys has played in just one other main draw event in 2011, losing to Patty Schnyder in the opening round in Miami in a third-set tiebreaker. The current world no. 456 lost in the opening round of qualies at last year’s Open. Above, Wilson pits Keys in a great video with professional opera singer Lily Oh. In the vid, the two ladies try to teach one another a few tricks about their vastly different trades. The result? Mostly hilarity. Below, TSF gets in a few Qs with the NYC-bound teen before her first-ever Open main draw. TSF: You can use your Wilson racket to do anything other than play tennis. What would it be? Madison Keys: I would eat every meal off of it. TSF: Flossing is something ___________. MK: Flossing is something everyone lies about. TSF: Say you have the option to play in just one of the four Majors — ever. Which do you choose? TSF: Katy Perry’s “TGIF” video is _________. MK: Katy Perry’s TGIF video is one of my favorites. TSF: Speaking of “TGIF,” Rebecca Black’s “Friday” got removed from YouTube. This makes you feel what? Because? MK: It makes me feel sad because of the hateful comments, but also grateful that my sisters stopped playing it. TSF: How did you celebrate your sweet 16? MK: Went out with friends for a movie and ice cream. TSF: What’s your favorite kind of ice cream? TSF: Andre Agassi and Steffi Graf offer you to play doubles — with one of them. Who do you choose? Imitation time: Somehow, Novak Djokovic‘s imitations just haven’t gotten old. The new world no. 1 obviously has a creative side and loves to be goofy, and we appreciate the new medium used for his latest acting gig: playing Maria Sharapova. Nole is well versed in his Maria-dom, but here he takes on Sharapova’s ad for HEAD‘s YouTek Instinct racquet and sort of nails it. More to come for the Open? We wouldn’t be surprised. Move over, cameraman. The ATP Uncovered video series has this great behind-the-scenes look at Novak Djokovic and Jelena Ristic doing a photo shoot for Hello! magazine in July. Our fave part? GF Jelena speaks her mind on being pampered, Nole’s dream and living it up — together. Watch above. The Sorana two-step? No, we’re not huge fans of the ill-advised headband that Sorana Cirstea is rocking in the latest Xperia Hot Shots video, but once we got past that, we were completely digging the latest video installment from the behind-the-scenes series. Rosero McCoy, a choreographer most recently known for his work on America’s Best Dance Crew teaches the Romanian a few moves of her own in a two-part video sequence. The next vid, yet to be released, will feature Sorana in a Katy Perry-inspired get up with a crew of back-up dancers strutting her stuff. But does she have the (dance) game? “Tennis, it’s easier, to be honest,” Sorana says during rehearsal at one point. Bring your A-game, SC! Creative juices, please. The WTA is doing something different with new-found star Sabine Lisicki. And we sort of love it. Sure, Sabine isn’t new to most insider tennis fans, but her semifinal appearance at Wimbledon has vaulted her into quite the public eye in tennis terms, and also has inched her ahead of the blossoming talents of Andrea Petkovic and Julia Goerges, who — among the three of them — are trying to bring somewhat of a women’s tennis renaissance to Germany post the Steffi Graf (and Anke Huber?!) era. ryan harrison on the rise? Ryan’s rise? This might be Ryan Harrison‘s moment. 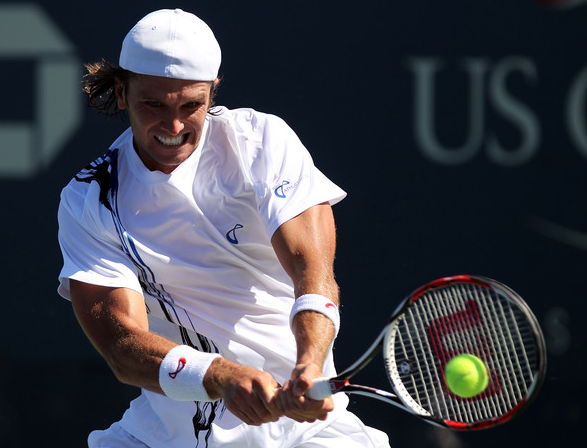 One of the rather promising up-and-coming American youngsters, Harrison is a name that has been thrown around for a couple years and really impressed in a five-set loss in the second round of the US Open last summer to Sergiy Stakhovsky. The 19-year-old has stayed consistent on the tour, and had somewhat of a breakthrough at Wimbledon, reaching the second round after getting into the draw as a lucky loser and playing brilliantly at times against David Ferrer, losing in five sets. Combat tennis. Normally we might ask: How do these people actually have time on their hands to do something like this?! But in truth, we really dig this fun, quirky take on tennis meets combat. Sure, it’s overproduced and cheesy, but doesn’t that make it all the more lovable? On this TGI Friday we say, TGFTF (Thank god for tennis fans). More creative stangeness can be found at the video maker’s website, PatrickWillems.com. Willems co-runs Lumberjack Films, in Saratoga Springs, N.Y.